At some point in your life, you must have thought about a unique or funny name you can use online for social media purposes. But if you haven’t come to a decision then visit these 10 best Username Generators available for Free where they can help you find the right one. 1.1 Why is it Important to Get Unique Username List For Your Own? When it comes to social media websites like, facebook, twitter, Instagram, or Tumblr We love to think of something creative and unique username that is based on your personality or simply reflects it, Whether it is for gaming activity or just for looking cool on Social Media. Sometimes it becomes quite boring to use just regular names and the main problem lies when you can’t come up with some different and kickass name that everyone likes. The worst thing about using your real name is that people forget you who you are because the name indicates nothing special about, especially the person you haven’t met and when you message them they hardly accept your friend request or just blocked you. This can be embarrassing for many of us. Nowadays the internet is surfacing with millions of users and thanks to the technology now you can also get ‘’creative usernames’’ by not just thinking but simply generating them. You can use them for both personal and professional purposes. Why is it Important to Get Unique Username List For Your Own? Usually, people like to stay active for a longer time on social media circuits just to get in touch with people they want in their lives. The main purpose of using these names can make you look more cool and awesome in front of someone. There is a saying that ‘’ the first impression is the last impression’’ exactly like that when someone finds the name attractive then he or she will try to approach you to see the actual person. It is a pretty amazing way to get more friends online and also you make popular among them. This is a website that gives you a favorite list of names. It is also the first choice for people all over the world. It uses a random name that can describe your personality. Just enter your name and you will get to see some cool name suggestions. You can select a category you want and get fascinating results. It is another reliable site that can use your real username based on the info you have provided. You need to fill some details like nickname, hobbies, account name and other things. After doing that you will certainly get options to select usernames and generate them with user-friendly tools the way you want it. 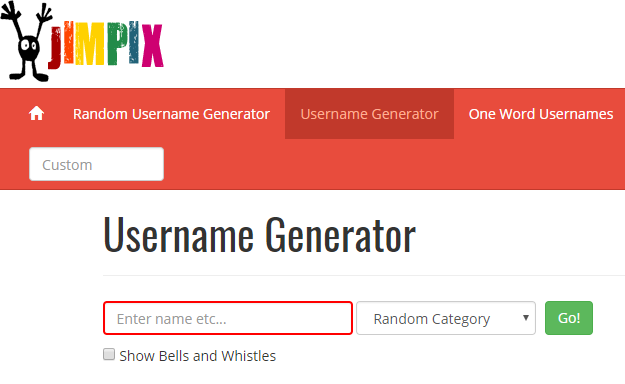 Screen name generator is one of the best ‘’username generator Instagram’’ websites to produce authentic names that makes you quite interested in selecting them. The most amazing thing about it is that you can choose your username and modify it with cool avatars also add titles to make it professional. The speedy password is an excellent website and generates internet usernames but also gives you secure password as well. it can also give you so many options to customize your username with values, symbols, characters, numeric titles and much more. You can easily enable all its features with its user-friendly interface for better functioning. It is certainly one of the best Username Generators available for Free sites that you can use for ‘’ username generator for games’’ the reason is simple these days gamers want cool looking name and by using this site it can fulfill all your needs by providing you always fresh names and you get to choose from over 6000 names. You can also select which gaming category you love as well. Fantasy name generator can make all your username wishes come true. It specifically aims to give names for social media sites and you can free sign up and pick any 12 names that you have liked most. You can also customize them according to your needs. This is a website that is exclusive to the only gaming website. You can create hundreds of usernames with varieties and options. You can even make your PSN ID and come up most funny and adorable name to date. Moreover, it also allows you to generate names to use for other game like RPG, action, arcade, FPS games and many more. This website has the ability to provide 1000 names at the same time. KRASPER is highly recommended as ‘’youtube username generator’’ it is a professional site and always gives you authentic usernames. You can also use it for creating brand names for YT community. Also, it can help to generate cool and unique tags for your YouTube channels. LINGOJAM is a website that not only allows you to generate cool names but also provide results based on your information. You will get to select fantastic avatars and customize all your usernames. Just visit the site and sign up for free to take full advantage of this website. This one mainly focuses on giving people what they really want. Its separated into two categories and each of them you have to fill and provide accurate info to generate names for social media and gaming activities. Also, you can use it for ‘’username generator Tumblr’’ and come up with the name you want. You can attach your real name and simply get both side results. Make your personal combination of words and come up with an attractive username. 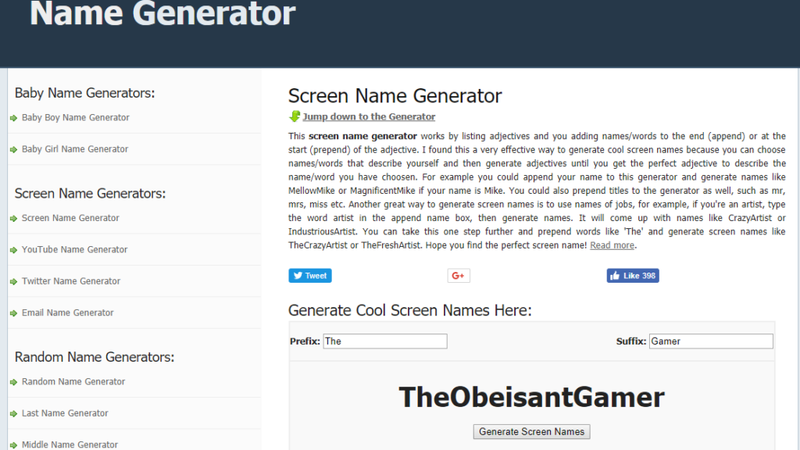 Above are the top best Username Generators that I was able to find. Hope it will help you to fulfill your needs. Do you know any other best tool for this purpose? Try these tools and share your feedback in the comment box!